Καλοτοποθετημένο στη περιήγηση σε αξιοθέατα, θρησκευτικά αξιοθέατα, πολιτισμικά αξιοθέατα περιοχή της Inle Lake πόλης, το Three Seasons Inn and Spa είναι το κατάλληλο μέρος για να χαλαρώσετε από τις πολυάσχολες μέρες σας. Σε απόσταση μόλις από το κέντρο της πόλης και από το αεροδρόμιο, αυτό το 1 αστέρων ξενοδοχείο προσελκύει αρκετούς ταξιδιώτες κάθε χρόνο. Με την βολική του τοποθεσία, το ξενοδοχείο προσφέρει εύκολη πρόσβαση στους προορισμούς της πόλης που πρέπει οπωσδήποτε να δείτε. Το Three Seasons Inn and Spa προσφέρει επίσης πολλές εγκαταστάσεις για να εμπλουτίσετε την διαμονή σας στη Inle Lake. Τα δωρεάν WiFi σε όλα τα δωμάτια, 24ωρη φύλαξη, ημερήσιος καθαρισμός, τζάκι, υπηρεσία ταξί είναι μόνο λίγες από τις εγκαταστάσεις που κάνουν το Three Seasons Inn and Spa να ξεχωρίζει από τα άλλα ξενοδοχεία στην πόλη. 15 δωμάτια μοιρασμένα σε 3 ορόφους παρέχουν ένα ζεστό και ευχάριστο σπιτικό μακριά από το δικό σας. Σε επιλεγμένα δωμάτια θα βρείτε μοντέρνες ανέσεις όπως ντουλάπα, προϊόντα καθαρισμού, θυρίδα, δωρεάν τσάι, πετσέτες. Εξάλλου, το ξενοδοχείο διοργανώνει πολλά ψυχαγωγικά δρώμενα έτσι ώστε να έχετε πολλά πράγματα να κάνετε κατά τη διαμονή σας. Όποιος κι αν είναι ο σκοπός της επίσκεψης σας, το Three Seasons Inn and Spa είναι μια εξαιρετική επιλογή για την διαμονή σας στη Inle Lake. owner arrange a boat and car to the lake and sight see for Taunggyi and KalawKalaw. breakfast Breakfast is supported included also traditional foods. They have also rent bicycles. The hotel location was great. If you care for a private parking lot and a television (with only Myanmar programs) in your room, don't stay here. However, as a traveller who knows only one Myanmar word, Mingalaba, I need neither of those things. The manager, Mr A and hos staff were more than friendly and I felt like being at home. Appropriate advises and travel arrangement were so impressed. Zipping Myanmar wine at the toproof dining place in the afterglow of sunset is something unforgettable. The hotel location was great! It was of walking distance from the overnight bus drop off point. (Just tell the taxi drivers you stay at three seasons, and they will not try to get you to board their cab) We reached at 5+am and were able to walk to the hotel easily. There was a charge of 6000kyats for early check-in (we took the 3 bedder room), but it was inclusive of breakfast, which made it really worth it. Breakfast was simply but delicious! We requested for Shan noodles for our 2nd day, and the Shan noodles they got us were the best I’ve had for my trip. 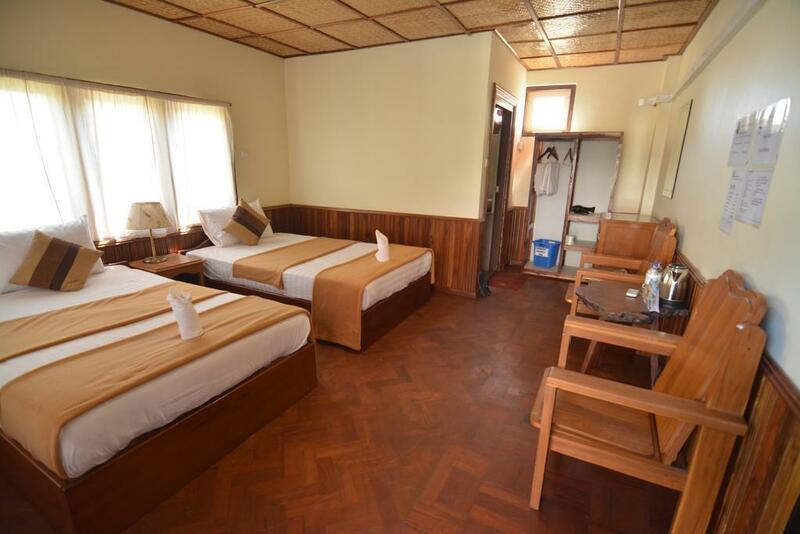 The staff also booked our Inle boat tour, overnight bus tickets and Kakku trip for us at reasonable rates! Only gripe was that the towels weren’t the cleanest. But we brought our own towels, so it wasn’t that big a problem. The hospitality of the staff more than made up for it. Overall, the stay was comfortable and really value for money! Pros *cheap and has all basic needs *simple breakfast but staff will order traditional food if you want to try *good location Cons *stains on towels and curtains Hotel is cute and nice design. Will be better if maintenance can be improved. We had the best time at Three Seasons Inn & Spa!! Room was made everyday (+ water bottles, new toilet products, etc) - very clean and lots of space :) The breakfast was delicious (especially the banana pancakes) and the staff was so nice, friendly and helpful! We rent bikes the second day, cheap price and in a good condition! Plus, they have great bike tours suggestions and tips. They booked us the boat for the lake tour (we recommend the one that includes Inn Dein) and it was cheaper compared to what other people told us. We would definitely recommend this place for any traveler : it’s cheap, perfectly located, great staff and facilities! The breakfast pancakes are the best in Asia and the staff are some of the friendliest. 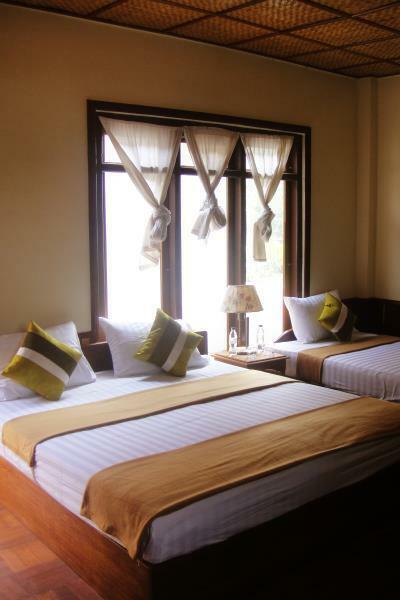 Like all of Myanmar and especially In le, the accommodation is a little expensive however 3 Seasons is well worth a visit! The room was dated and smelled a little of smoke but it was clean. Breakfast on the terrace was really nice! The owner organised a tour of Inle Lake for us and recommended a great Indian restaurant for dinner. The pancakes at breakfast are amazing!! And breakfast in general heavy and delicious.. Only downside is that breakfast is served only during 2 hours, so you cannot wake up too early for trekking/sleep until more than 8:45am and sometimes there's no table where to sit... The staff is also super nice! Floor in the room could be mopped though.. All activities available from the hotel reception. Good location with bikes available. The breakfast is substantial and the staff will organize whatever you need while you're there. Best part of this place is the owner. He's a lot of fun to talk to and full of warmth, smiles, and worldly experience. Ask him about his time as a sea captain! We loved our stay in Inle Lake and the staff at Three Seasons were super friendly and helpful! The breakfast is great too! - eggs, pancake, fruit, tea or coffee. They even gave us a takeaway breakfast when we left super early to catch sunrise on the lake. They will arrange all day trips and transportation for you. Have bikes for rent for $1,500/day. Would definitely recommend staying here! Very close to the main street and all restaurant, I was here for 2 nights. I suggest arranging all tours and airport transfers through them, since they have the best prices. Don't get a random taxi from the airport, there's this sort of taxi mafia going on and they will overcharge you. I would stay again! I journey this area to visit friends in Taunggyi once per year. On the past few occasions, I stayed at 3 Seasons. 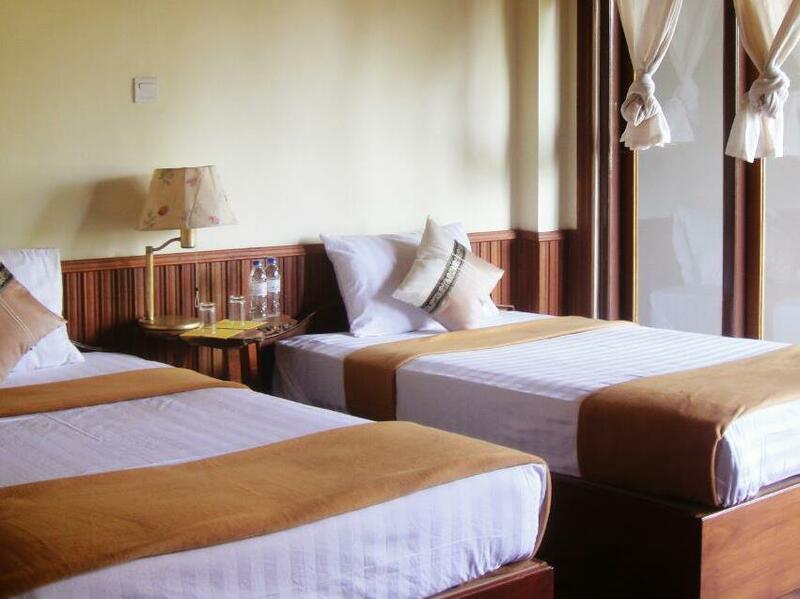 The location is convenient (proximity to central market and local transport between Nyaung Shwe & Taunggyi) and the inn's owner is quite kind. In the past, 3 Seasons met my needs at a good price. It now appears that the owner's son has taken over management of the inn, and service has taken a downward turn. The attention to detail & concern for guests appears to have disappeared. The male staff (including manager) spend a lot of their day playing online games. The effect is 2-fold: 1) the female staff appear to do all of the work, & 2) the weak internet connection (this is Myanmar) is only further slowed for guests by the bandwidth occupied by the gaming. I sincerely hope that 3 Seasons can return to good form in the future. Also, please stop serving that awful toast. The market is full of great fruit and local breakfast foods! Excellent place for that price! Nice, clean and spacious room, very helpful manager, trips and tickets easy to arrange, big and tasty breakfast, cheap bike rental, quiet street not far from the centre. Only wifi is poor but it's not the owner's fault - it's like that in all Nyaungshwe. No disadvantages, just book and come! We booked the twin room and got the large triple room. We came early at 5am and got the room immediately with the reasonable extra charge of 5,000 kyats/room including the breakfast. The price for boat trip and bicycle rent offered by the hotel are good. The boss and the staff are nice and helpful. We left the luggage at the hotel last morning and came back in the afternoon to use the bathroom for free. Good choice of hotel! I want to start by saying this is a positive review but I also want to give a true account of my experience. We arrived fresh off the kalaw to inle hike, power was out and our room smelt damp. All we wanted was a shower and we were underwhelmed by the hotel. Our mood changed once we spoke to Mr A's son (who was lending a hand running the hotel), he was really nice and apologetic about the power - not their fault, it's common in inle. He is also great at cards! We never mentioned the damp smell but after the power was back on the smell had gone. Laundry service w is very convenient. Boat tour was incredible cheap at 18000ky per boat! Bikes are also cheap at 1500ky, make sure you get one big enough, mine was a little small (I should have checked). Cheap drinks too. Only negative is the 'spa' is only a massage room. Breakfast is so filling, fruit, choice of eggs, thick pancakes. Staff went above and beyond to help with our bus and make our stay in inle as enjoyable as possible. The owner & the staff are really nice & helpful. Just talk to them to hear their stories :), and they will help you with your travel plan. The location & atmosphere is great. There is no warm water when we live there. That's 1 problem to concern. really centr location just 10 min by walk to boat pier. 5 min to market and supermarket. Very calm place with rather big room. good hot water pressure. Very nice breakfast. They have early check in just 5000 k inluding breakfast and it is very suitable who came by night bus. Very freandly staff.